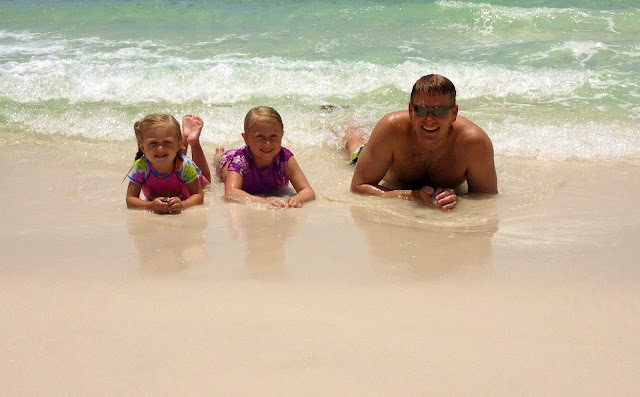 We just returned from nine days of rest and relaxation-- our annual trip to Destin, Florida. Growing up, my parents had taken me a few times. And then while we were living in New Orleans, we made several trips to the "Emerald Isle" with Afton. Now that we are living in North Texas and about 13 hours away, we still make the drive. Destin is like no other beach I know. So I thought I would share with you some of our photos, condo information, my favorite restaurants, and trip tips-- who knows you might just decide to take a trip there yourself! We always break up the drive a bit. 13 hours in the car is looooong, so we make the trek from Dallas to New Orleans. The eight hours in the car (along with the help of books, coloring, games, snacks, and movies) isn't really that bad. My husband likes to do the driving, so I get to read and keep the girls happy. After visiting friends and getting beignets at Cafe Du Monde, the last leg of the trip is an easy 4.5 hour drive. 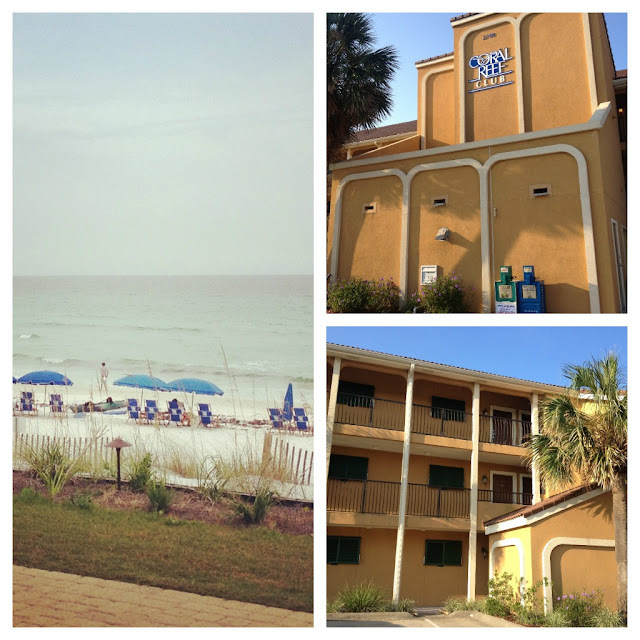 This was our first year to stay at the Corral Reef Club, but we will definitely be staying there again. 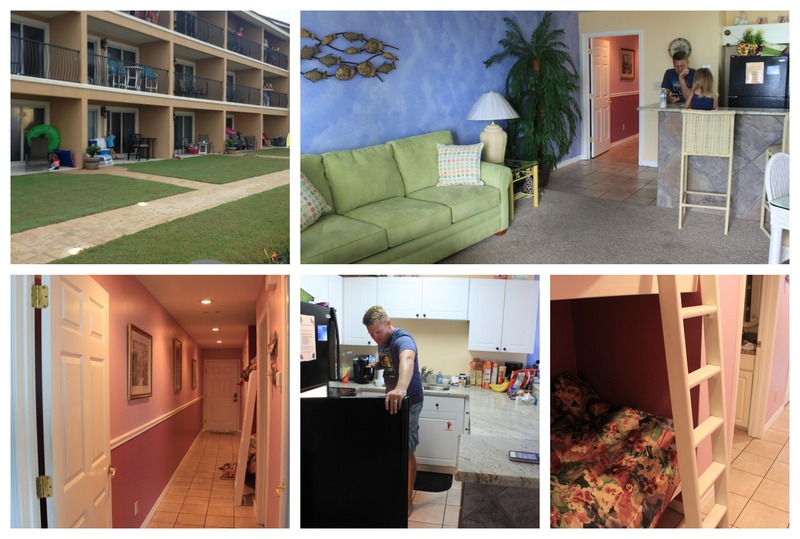 Our condo was on the first floor with it's own 'yard' and just a short walk from the beach. This is especially important with little ones. Running back to the condo to grab a forgotten snack or toy was no big deal! And at nap time, I relaxed on the porch with a book while the girls rested inside. Our condo was a one bedroom. It had a 'jack n jill' bath with a shower/tub. The girls shared bunk-beds in the hall. (This was a big hit!) There was a door separating the sleeping quarters from the family room/kitchen. Which was so nice in the evenings- we could close the door and watch tv and talk while the girls slept. The kitchen had everything we needed. And most importantly, there was a washer/dryer, which we used a lot! The condo also came with wi-fi (which is how I kept blogging last week) and chair service. Chair service is one of my favorite features, I loved going down to the beach each morning and having a set of chairs and umbrella ready and waiting for us. We ate breakfast in the condo each morning and had coffee on the patio. Then we played on the beach for a few hours. For lunch, we came back up to the condo and ate a simple lunch on the patio. Some days Maisy would nap after lunch, but mostly she kept up. We spent the rest of the afternoon on the beach. Around 3 or 4pm we called it a day. After showering and laying around a bit, we headed out for dinner. Eating out every night was a treat for the girls-- and us! -We also ate at Joe's Crabshack, I am not a fan- but they do have a playground for the kids while you wait. We are beach people. We love to be on the beach all day- in the water, on the sand, under the umbrella. When we booked at the Corral Reef, we knew they did have a pool, but only a small one. This was fine with us. We swim in the pool at home, we drove to Florida to do the beach! Besides the usual floating on waves, boogie boarding, and making sand castles, we also flew kites, went on shell hunts, and dug for buried treasure. We also ate a lot of snacks, met a few new friends, and took some 'cat naps' under the umbrella. At night, after dinner we got ice cream, played mini-golf, and the girls jumped on trampolines. My favorite evening activity was walking on the beach. After it got dark, we grabbed flashlights and buckets and went searching for sand crabs. They were white, the color of the sand, and so tiny. We chased them with the flashlights and then Jeff scooped them up in the bucket. He even caught a few that were not so tiny. At the end of our walk, we let them go and watched them run back into the ocean. The weather was beautiful, but we did get about 1 day and half of rain. On a rainy day in Destin, we played board games, went out to lunch, and shopped for souvenirs. There is also a bowling alley, movie theater, and mall nearby. But we enjoyed our little outing and then just relaxed on the couch and watched the Olympics. Now grab your favorite Havaianas flip flops, sunscreen, and a few swimsuits. It doesn't take much to get ready for this vacation! Destin is a great family-oriented beach. There are so many places to stay, homes, condos, and even high rise hotels. No matter your budget or your interests, you will find it. Golf, para sailing, jet ski rentals, fishing, dolphin tours, boat excursions and more! Everyone we met was friendly and helpful. And the girls had a hard time coming home. We will definitely make the trip again soon! 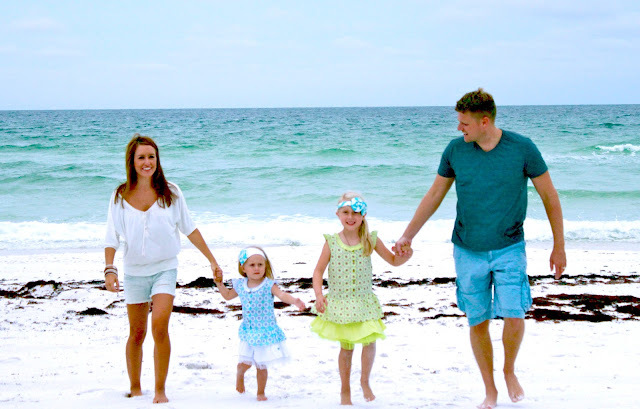 Where is your favorite destination for family vacations? 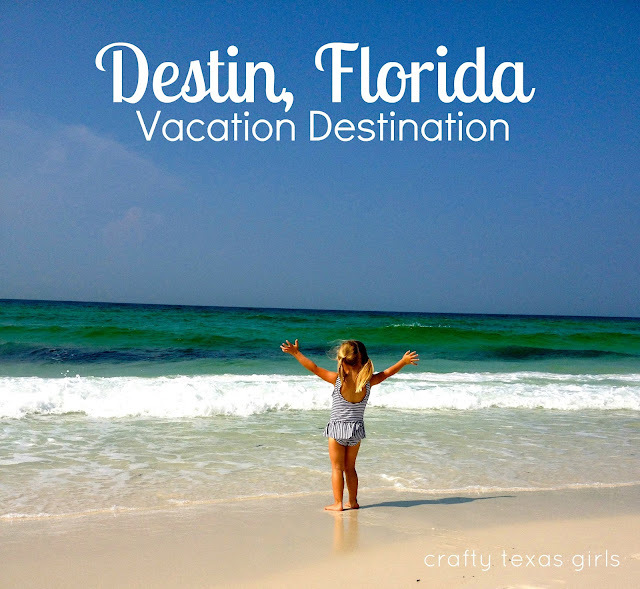 This post is not sponsored by the city of Destin or any businesses mentioned above. I just wanted to share my family's experience with you! This is Melissa @ Daisy Mae Belle. I grew up going to Destin! Such an amazing beach! 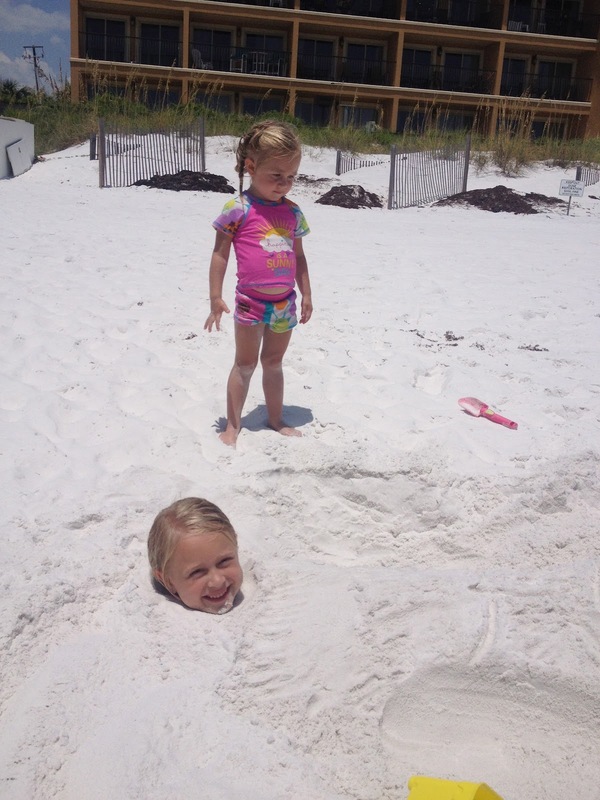 My family now goes to Perdido Key. Right on the Florida/Alabama line. Our annual trip is coming up in October. Ten glorious nights! We can't wait. I will start the countdown as soon as they start back to school on Friday! Can't wait! I must admit I am a bit envious. We have been saying how much we need a get away. Thank you for sharing your happy memory making Hugs!